If there was ever an alarm clock to leave at home whenever you travel, it’s this one. The Defusable Clock from Michael Krumpus looks like a bomb, complete with suspicious wires, countdown clock and circuit board. When the timer is activated, you have ten seconds to cut the correct wire and stop the alarm from sounding. 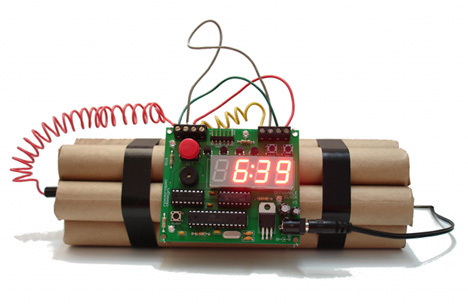 If you cut the wrong wire the clock will detonate immediately. But if you succeed, you have to rewire the clock before tomorrow morning, so it’s kind of a trade-off. According to Krumpus, the wires are attached by screws so it’s simple to replace them. The wires switch around thanks to a randomizer, meaning that the location of the “correct” wire will change from one day to the next. 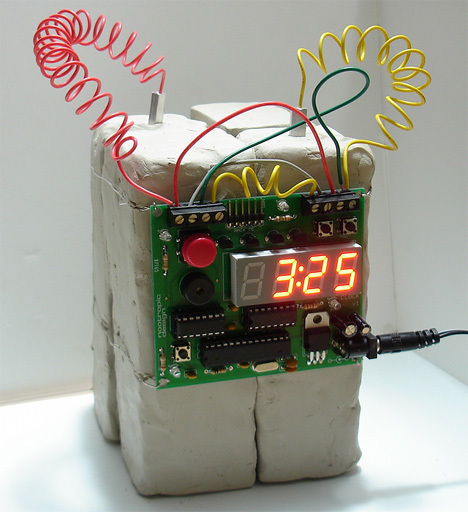 Krumpus created “dynamite” and “plastic explosive” versions of the Defusable Clock just for fun. The creator of the Defusable Clock would like to point out that it is no more dangerous than any other alarm clock – although he still doesn’t recommend building one yourself and mailing it to a friend. See more in Clocks & Watches or under Gadgets. October, 2011.